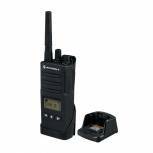 Motorola XT460 Business Two Way Radio RMP0166BDLAA Pack of 1 Walkie-talkie with 8 channels and 219 privacy codes. Based on PMR446 standard. Military-grade toughness: dust, rain- and shock-resistant design. Rechargeable battery with charger pod included. Includes carry holster with swivel belt clip. 9km range. 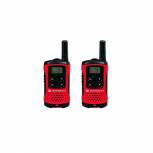 Motorola TLKR T40 Consumer Two-Way Radio (Pack of 2) MR61583 Pack of 1 Compact walkie-talkie with LCD, scan/monitor mode. Based on PMR446 standard. 500mW transmit power for up to 4km range. 8 channels to avoid interference. Requires 3x AAA batteries per handset. Includes 2x T40 radios and 2x belt clips.